Has any vegetable been vilified as much as the humble Brussels sprout? Well, I'm sure broccoli would be able to make a good case. I know lots of people say they don't like them, and I think there are two reasons for that. Firstly, we ate them as children when our palates weren't quite ready – kids have a survival instinct to avoid "dangerous" food, and green vegetables like the brassicas seem to be on that list. Secondly, boiling is absolutely the wrong way to cook them. A light steam, maybe, but the way to really enhance them is with a quick blast in the oven. 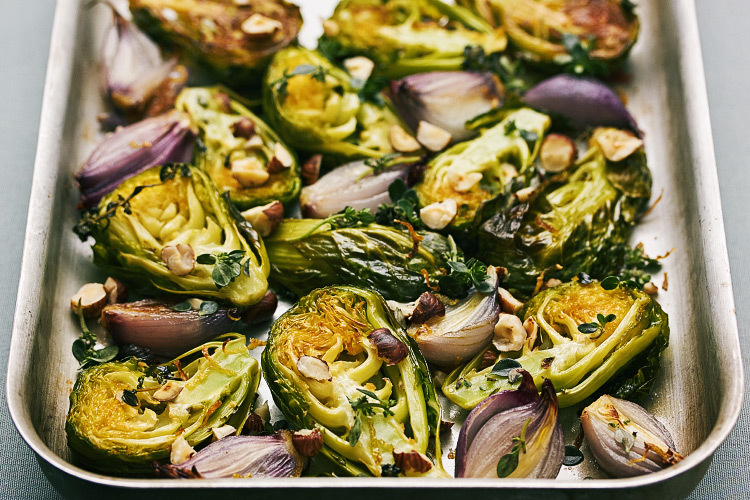 As we head into the final weeks of the year, when side dishes really come into the spotlight, here's one of my favourite ways to cook Brussels sprouts. Serves 2, as a side dish. Trim and halve the Brussels sprouts and red shallots. Toss in olive oil on a baking tray. Grate the zest of the lemon over and scatter with little sprigs of the lemon thyme. Season with salt and pepper. Roast in 200°C (400°F) oven for 35-40 mins, tossing halfway through. 5 minutes before the time is up, scatter with the chopped hazelnuts. Serve with a good squeeze of fresh lemon juice and a few more lemon thyme leaves.